Hydrangeas macrophylla, commonly called mophead hydrangeas, hortensias or florist hydrangeas, are considered the most popular hydrangea species. Hydrangeas macrophylla generally grow 3 to 6 feet tall with a rounded shrub form. These hydrangeas bloom in pink, blue or sometimes white flat-topped flowers from late June until August. The Hydrangea macrophylla is hardy down to USDA Plant Hardiness Zone 6, where winter temperatures rarely dip down to -5 degrees F. Hydrangeas macrophylla are commonly sold by florists as potted indoor plants during spring, some of which need considerable protection and care to survive the winter months outdoors. Water hydrangea macrophylla deeply and thoroughly once a week in the absence of rainfall to prevent the soil from drying out completely. Feed the hydrangea in late winter or early spring with a slow-release, balanced fertilizer. Spread the fertilizer granules on the ground around the base of the plant at a rate of 2 pounds per 100 square feet, and water thoroughly. Spread a 2- to 3-inch-thick layer of organic mulch on the ground over the root area of the hydrangea macrophylla to retain soil moisture and control weeds. Spread a fresh layer of organic mulch once each year in early spring. Prune hydrangea macrophylla right after the flowers fade in late summer to remove weaker shoots at the base of the plant. Also remove any dead or damaged growth. Protect hydrangea macrophylla from winter frosts, freezes and snow beginning in November or December. Tie the shoots together in a bundle using soft twine and wrap the bundle in burlap, or place a cage made from chicken wire over the hydrangea and fill the cage with leaves for the winter. Plant hydrangea macrophylla in a spot that receives full to partial sunlight and has moist, fertile soil. Don't plant hydrangeas in dry or windy sites. If you live in a warmer climate with hot summers, select a planting location that offers some protection from the hot midday sun. 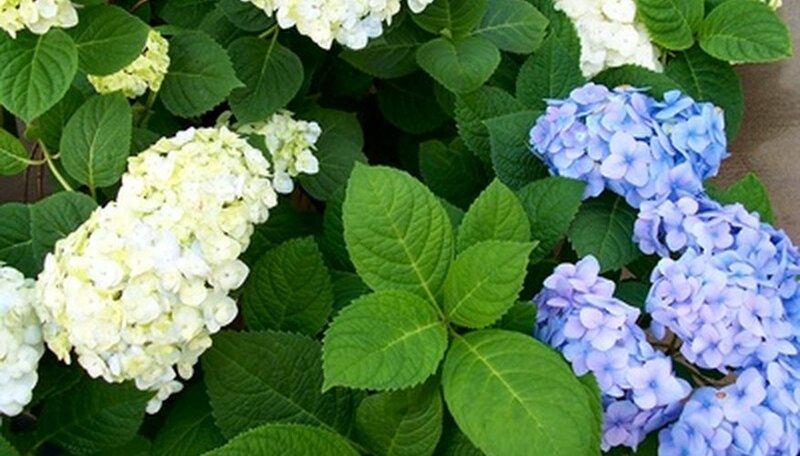 Alter the color of your hydrangea macrophylla's blooms by adjusting the soil pH. If you want blue blossoms, make the soil more acidic by adding iron sulfate. If you want pink blossoms, add lime to the soil to make it more alkaline. Avoid pruning hydrangea macrophylla in early spring, because this type of hydrangea blooms on old wood and you may remove potential flower blossoms. Also, avoid pruning the hydrangea after September, because this can harm the plant's health.